ECU is a large, multi-campus institution offering a vibrant research culture and a unique teaching and learning environment. With over 30,000 domestic and international students, we're committed to breaking down barriers to education and are considered a pioneer in alternative admission pathways to education, helping more Western Australians reach their potential. Our organisational structure includes a range of professional services that guide and support our schools, research centres, teachers, students and the communities we serve, all under the governance of our University Council. Visit individual professional services to discover how they contribute to the ECU experience. Brand and Marketing leads ECU’s brand, marketing and communications requirements to deliver the University’s strategic objectives. Key responsibilities include brand development and management, advertising and promotions, public relations and corporate communications, corporate events, digital marketing, social media, web design and development, and sponsorships. Business Growth and Development provides support to current and prospective students through inbound and outbound communications and enquiry management. It incorporates a Customer Strategy and Planning function, responsible for driving a customer-centric approach within the University, and guides Schools in developing and executing specific growth strategies aligned with ECU’s strategic goals and initiatives. The Centre for Learning and Teaching provide a variety of services to our teaching, learning and staff communities such as staff development opportunities, teaching technologies, student preparation for university courses and expert advice on teaching and learning. The Facilities and Services Centre provide an on and off-campus facilities management service right across our campuses for everything from new buildings, space management, leasing, cleaning, grounds and maintenance to fleet management, security and traffic services to student housing, sports and fitness, food services and The Co-Op Shop. Our Finance and Business team provide a valued financial management service ensuring we operate with effective governance and financial integrity. Our Graduate Research School offers support and services to research masters and doctoral students, their supervisors and faculties. We aim to enhance the quality of the research experience by providing training, peer-to-peer support and promoting research culture through seminars, academic events and social activities. HR defines the University’s staffing practices that help staff with activities including recruitment and appointment, staff planning, employee relations and performance improvement, setting pay, benefits and conditions and ensuring our work environment is safe and productive. 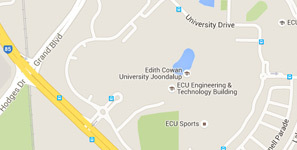 The Information Technology Service Centre (ITSC) supports the day-to-day activities of students, staff and researchers here at ECU by providing email services, access to information systems using secure computer and communication networks and facilities such as teaching labs, student eLabs, multimedia equipment hire, wireless connections, and technical help via IT Service Desk. The International Portfolio is responsible for leading the University's international growth, engagement and the establishment of new international education and commercial enterprises. It manages the University's principal international partnerships, and it develops and supports international relationships that: enhance the University's global reputation; grow international student participation and income; deliver high quality transnational education programs; attract students to the University though international partnerships and pathways; secure access to new resources for research and research students; and, enable student and staff mobility for collaboration with international partners. The portfolio performs strategic planning and development functions in very close conjunction with Schools to support their success in the diverse activities which exemplify ECU's Internationalisation. The Library provides services for students and staff – both on and offshore, alumni and community networks. Use the Library One Search and subject databases for access to books, journal articles and other materials for your studies and research, and get support for assignments and research via workshops, tutorials and individual assistance. The Office of Development and Alumni Relations is responsible for building and maintaining life-long, mutually beneficial relations with ECU's alumni and community partners including achieving philanthropic and 'in-kind' support. The Office is responsible for supporting alumni as individuals and groups, encouraging their participation in the life of the University and securing financial support for ECU's strategic priorities. The Office of Research and Innovation plays a crucial role in facilitating our research outcomes by providing staff with assistance in identifying funding opportunities through to submitting grant applications. The Innovation arm of the Office assists researchers in assessing their inventions for commercial potential and providing guidance on commercialising their inventions. Strategic and Governance Services supports ECU’s Governing Council and provides advice and expertise to the senior leadership and the University community in relation to performance and governance matters to enable the University to meet its strategic objectives and operational requirements. Strategic and Governance Services is comprised of five functional areas - University Governance, Strategy & Performance, Legal & Integrity, Academic Governance and Standards and Risk & Assurance. ECU's Student Administration directorate supports the student experience through robust systems, data and resources that facilitate a streamlined transactional and digital self-service capability. It processes admission applications, manages fees and scholarships, and provides examination logistics and result administration. It also develops and maintains academic and examination timetables and supports CRM and student systems. The Student Life directorate collaborates with all ECU student service providers to facilitate delivery of a seamless student experience. It delivers services for current students, including face-to-face enquiry services, course advice, health, counselling, equity, diversity and disability services, transnational and national program support, chaplaincy, student success programs and student transitions and careers and employability services.